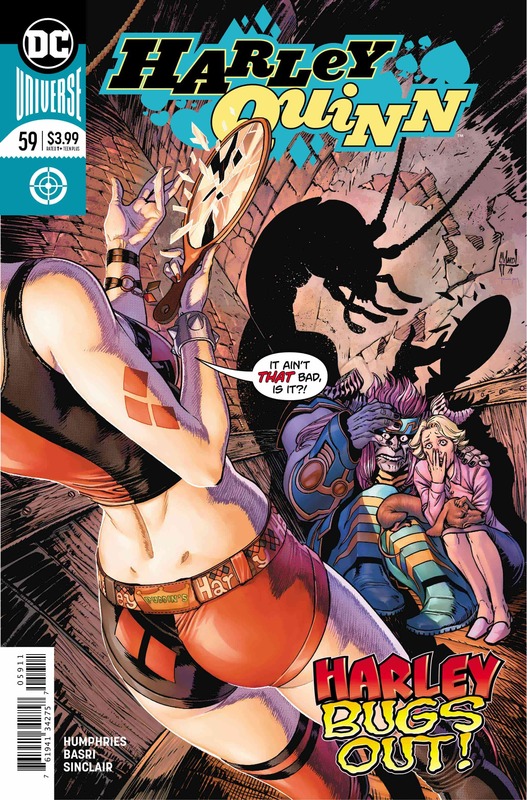 Harley Quinn #59 Review – AiPT! It’s the homage nobody asked for: Harley Quinn goes Kafka in this issue’s nod to The Metamorphosis. With visions of vengeance and a cool flaming sword in her head, Harley awakens to find herself out of bed. Scuttling to the bathroom to freshen her breath, she’s curious as to why her mouth smells like death. Upon further inspection of her mirror’s reflection, she discovers some changes to her perma-white complexion. Where once her fine eyebrows lay on her head, now extends an insect’s antennae instead. Mandibles replace her beautiful, red lips, and wings extend down to her hips. Smashing her mirror, which makes such a clatter, Tina rushes in to see what’s the matter. Fleeing her friend and what she might think, Harley’s new face makes her want to blow chunks in the sink. Will Harley break the three witches’ curse or will this trial leave her countenance adverse? One part Kafka, one part superhero story, Sam Humphries’ “The Trials of Harley Quinn” is a must read. Between the references to The Metamorphosis, wonderful art and insightful character exploration, there is a lot to love about Harley Quinn #59. However, Humphries’ use of excellent themes and dialogue with perfect comedic timing makes this issue truly great. From the opening pages, Humphries expertly introduces the theme of the current trial through Harley’s narration. Focusing on her triumph over the trials, Harley dreams of the approval she will receive from her legion of fans. However, the focus of her words, and her fans’ adoration, ultimately falls on her looks as she claims, “I look so cool and hot!” It is from this point forward that the issue centers on a message promoting positive body image. From Harley’s street fair dunk tank with Tina to her subsequent transformation at the hands of the witches and public ridicule, Harley Quinn #59 serves as a warning about giving power to anyone who only appreciates you for your looks. It is Humphries’ use of themes surrounding body image that really makes this issue stand out. One of the things that I love the most about this story-arc is that it is evolving Harley as a character through the examination of her fears. Harley’s fears regarding appearance reflect those of many readers. This goes a long way into humanizing the character and making her more relatable. Humphries’ ability to make me sympathize with the one-time villain is a testament to his work with the character. Sam Humphries’ take on Harley’s dialect as well as his comedic timing make the issue that much more enjoyable. When I’m reading his dialogue, it is easy to imagine Arleen Sorkin delivering each line. Additionally, his comedic timing is always on point. One of my favorite moments from this issue involves the scene where the three witches curse Harley. In the middle of their incantation, the witches are interrupted by someone searching for a hotdog. The subtlety of how this moment was handled left me smiling from ear to ear. Additionally, Humphries’ nods to Kafka’s The Metamorphosis add an extra layer of enjoyment for the reader. From Harley’s transformation and the loss of her voice to her interest in trashy food, there are a lot of parallels with Gregor’s transformation in Kafka’s work. Little details such as the public throwing apples at Harley in the same way that Gregor’s father threw an apple at him are cleverly thrown in. Thankfully, Harley doesn’t meet a similar fate. Sami Basri’s art with Alex Sinclair’s colors do an excellent job telling the story. The duo’s work does a great job conveying Harley’s transformation into an arthropod while retaining a narrative consistency that doesn’t veer too far into the realm of horror. Sami Basri’s art expertly conveys each character’s emotions despite the fact that one of the characters has been transformed into an insect. Much like Mirand’r, we are able to read Harley’s body language without the need for her thought bubbles thanks to Basri and Sinclair’s work. My only gripe with this issue is that I feel more could have been done to set up the three witches’ motivation. Their inclusion in these trials is rewarding for those who have been reading Sam Humphries run since he took over. Unfortunately, their relationship with Harley could be a little confusing for those who have just jumped onto the title. In the previous issue, I had no idea who the witches were. However, their motivation isn’t the story here as it wasn’t crucial to telling Humphries’ message. Ultimately, Harley Quinn #59 is a great entry into “The Trials of Harley Quinn.” Humphries’ use of insightful character exploration and dialogue with perfect comedic timing, with Sami Basri’s wonderful art and Alex Sinclair’s colors make this issue great. However, Humphries’ use of relevant themes regarding appearance make this issue stand out. Between the references Kafka's The Metamorphosis, excellent themes, comedic dialogue, wonderful art and insightful character exploration, there is a lot to love about Harley Quinn #59. Sam Humphries' dialogue and comedic timing. The exploration of relevant themes regarding body image grounds the story. Sami Basri's art and Alex Sinclair's colors expertly tell the story. The exploration of Harley's fears to help her grow as a character is outstanding. The return of the three witches provides some pay off from the Captain Triumph story-arc. If you haven't read the Captain Triumph story-arc, then the inclusion of the witches can be confusing.